The air was cooler in the Redwood Grove than the surrounding, sunlit areas of the San Francisco Botanical Garden. The light that did make it through the thick branches of the trees reached the ground in patches, making patterns on the thin, winding trails. My mom and I were visiting the gardens while we waited for my brother to get out of his classes at UC Berkeley. 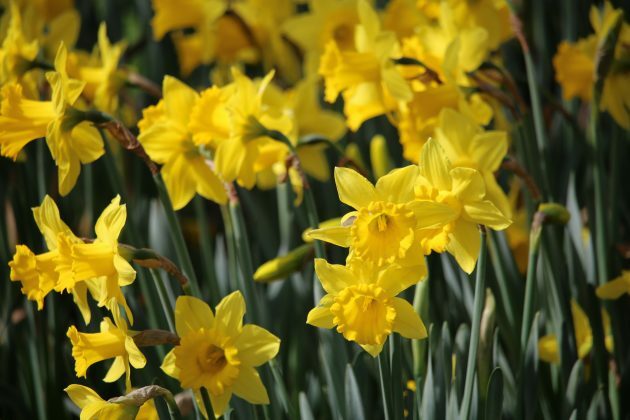 Flowers bloomed every which way, including an impressive array of daffodils arranged at the base of beautiful trees. The place was full of parents with toddlers, kindergarten school groups, and walkers like us. Of course, my eyes were always peeled for birds, and we had already spotted a Pied-billed Grebe, Allen’s Hummingbird, and more. Still, a lifebird was on the way. In the deep vegetation of the grove, a tinkling melody reverberated across the trunks and small hills. Our ears perked up: the song sounded exactly like a Winter Wren! Only, wait, did Winter Wrens live in California? Nope. Pulling up one of our handy dandy bird identification apps, we realized that though there were no Winter Wrens along the west coast, we did have a Pacific Wren in our immediate vicinity! The bird’s song was lovely, but we wanted to actually see the wren as well. Winter Wrens are secretive, hard to observe, but that didn’t seem to be a problem for the pair of Pacific Wrens. Nest-building must have been on their agenda, for they hopped this way and that with delicate moss bits hanging from their tiny beaks. They perched on top of a stump, at the edge of log, in full view of our camera lenses. It was awesome. 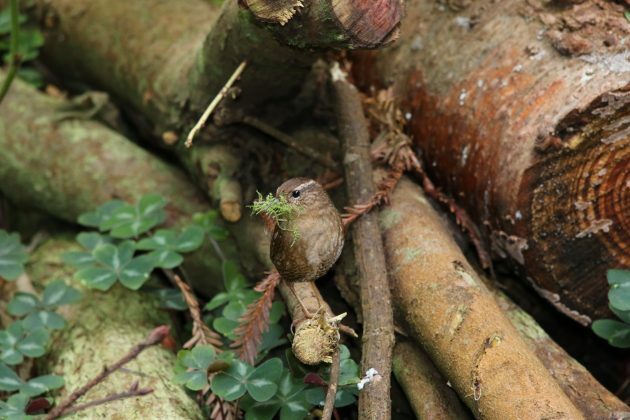 We heard Pacific Wrens throughout the gardens, especially in the patches of older-growth forest that the wrens prefer. 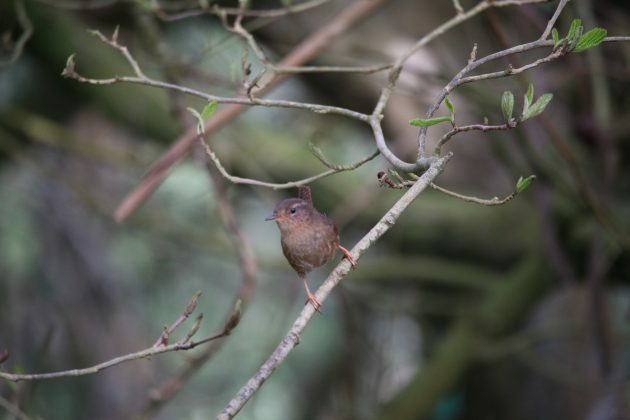 It’s no surprise we confused Winter and Pacific Wrens; until 2010, they were considered the same species! In fact, the Winter Wren was split into three species: the Winter Wren, the Pacific Wren, and the Eurasian Wren. For now, the population levels of the Pacific Wren are stable, with six million individuals spread out between the United States and Canada. Wrens are such charming birds. How fun to see it nest building!